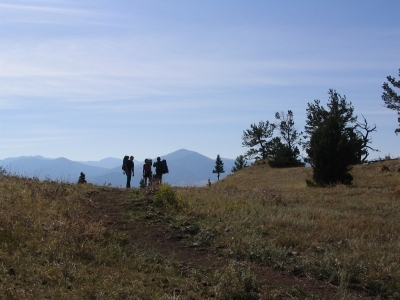 The 2.2 mile figure-eight loop trail climbs 700 feet from Bridger Creek through diverse vegetation and terrain, to the summit of Drinking Horse Mountain. A unique covered bridge serves as a beautiful gateway for the trail and eight memorial benches and one memorial picnic table offer scenic vistas of the Gallatin Valley. Location: Trailhead located at the Bozeman Fish Technology Center, 4 miles east of Bozeman, Montana along Bridger Canyon Road 86. From Main Street in downtown Bozeman, head north on North Rouse Avenue (State Route 86), 4.1 miles to the signed Bozeman Fish Technology Center access road on the right. The trailhead parking lot is to the left (north) of the access road approximately 200 feet east of the access road junction with Bridger Canyon Road. The trail begins on the south side of the access road directly across from the parking area. 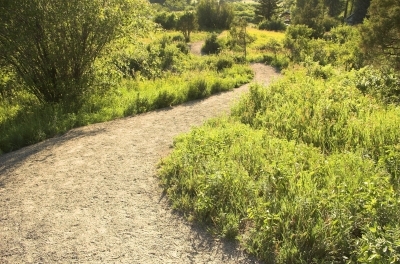 Open to the public for only a little over a year, the trail is quickly becoming one of the most popular trails in the Gallatin Valley thanks to its location within a 5 minute drive of downtown Bozeman, its easy access and the high quality experience it provides in a conveniently moderate distance. 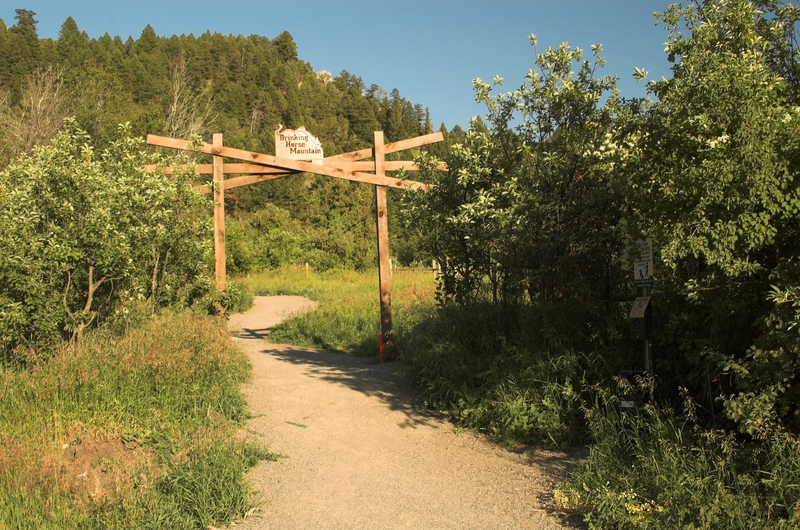 From willows and cottonwoods along Bridger Creek, to rocky outcrops, evergreen forest, and wildflower decorated hillsides, the Drinking Horse Mountain Trail offers great variety in a 2.2 mile figure-eight loop. The variety of vegetation provides a great opportunity for wildlife viewing, bird watching, and the study of nature. 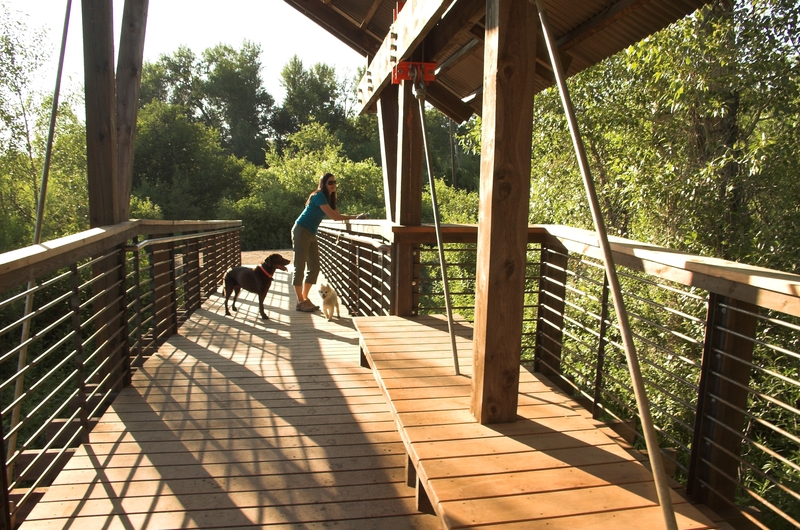 The figure-eight trail design has a steep route for those who desire more intense aerobic exercise and an easier path for those who seek a leisurely stroll. Dogs often bring their best human friends for some exercise and are pleased to find two dog sanitation stations for their convenience and plenty of cold water to drink in Bridger Creek. Two information kiosks are located along the trail to provide etiquette information and maps to help orient new users to the trail. Eight memorial benches and one picnic table made from recycled plastic are located along the trail and offer a well deserved respite with spectacular views of the Gallatin Valley, Bridger Canyon, and surrounding mountain ranges. The Drinking Horse Mountain Trail provides an alternative destination to the popular and often crowded “Foothills” and “M” trails which are administered by the U.S. Forest Service and located directly across Bridger Canyon Road. Parking at the trailhead for these trails often overflows onto the road and one of the goals of creating the Drinking Horse Mountain Trail was to spread out this heavy use. Pasture bench. Photo by Molly Webb. Summit ridge. Photo by Molly Webb.